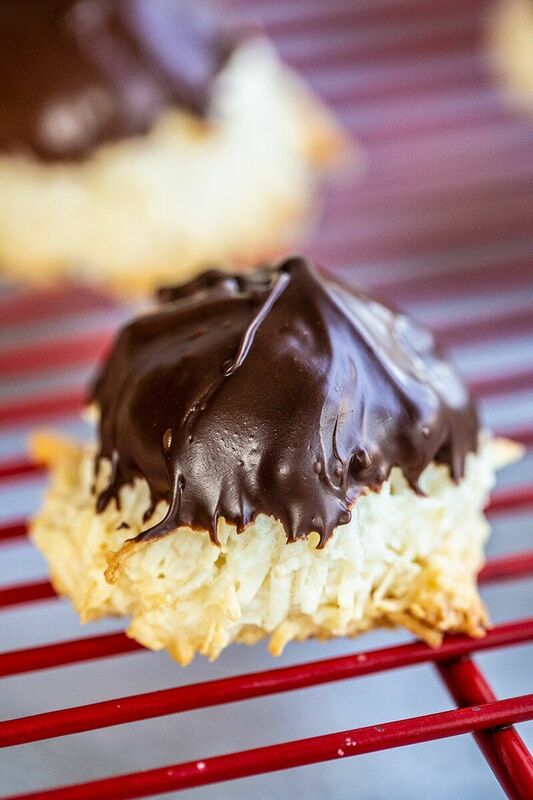 Chocolate Dipped Coconut Macaroons are one of my favourite treats ever, being a chocolate and a coconut fanatic. These are perfectly chewy, decadent macaroons that are so easy to make! Coconut macaroons are not the same as French macarons, even though people use the term interchangeable. 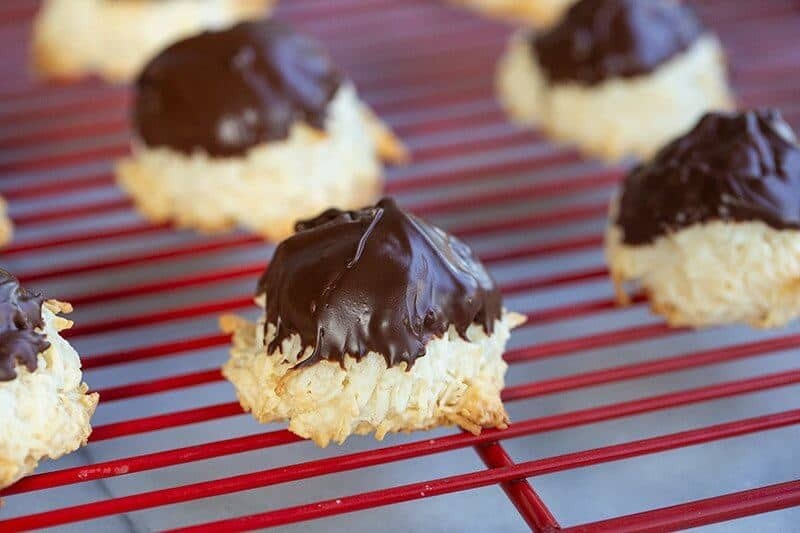 Macaroons are the coconut confections that are featured in this recipe, while the macaron (Proper French pronunciation – mack-a-ron, just like the men’s’ names, Mack and Ron) which are small delicate egg white/ground almond confections that have icing sandwiched between them. They are two entirely different things, and all it takes it adding that one “O” to the word to change it entirely! Coconut macaroons are so easy to make that you might not want to even try this recipe, it’s so easy, it’s evil! Combine the coconut, flour and salt. Open up the tin of condensed milk and mix in the vanilla. Right in the tin. Then mix in the almond flavoring. Add the condensed milk to the coconut. Mix very thoroughly, making sure the coconut is completely coated. Plunk them onto a baking sheet covered in parchment paper. I wouldn’t even try this recipe without it. Condensed milk doesn’t like to come off baking sheets. These are large, the size of golf balls so that the inside doesn’t dry out and remains chewy. Bake for 10-12 minutes until the outside is toasted and browned. Dip the tops and return to the parchment paper. Let the chocolate harden then store inside containers. You only need to crisp up the coconut on the outside and not bake the inside of these. You want them to be super chewy! These are better after sitting for a day or two, they get chewier! You don’t have to dip them in chocolate, you can leave them plain. Jazz them up for Christmas by dipping them in white chocolate and then using red and green sprinkles on top! They are super cute! If you are looking for some other easy dessert bars or treats, try my Seven Layer Bars or my Lemon Bars! Both are delicious! 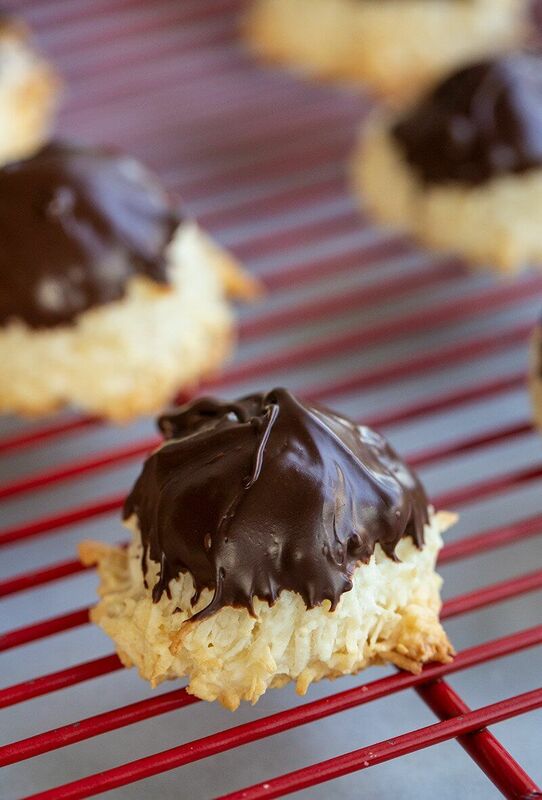 How to make delicious homemade coconut macaroons that are dipped in chocolate on top! Open up the tin of condensed milk and mix in the vanilla Mix in the almond flavoring. Add the condensed milk to the coconut. Mix very thoroughly, making sure the coconut is completely coated. Place them onto a baking sheet covered in parchment paper. Make them the size of smaller golf balls so that the inside doesn't dry out and remains chewy. Bake for 115-17 minutes until the outside is toasted and browned. .Dip the tops and return to the parchment paper. Let the chocolate harden then store inside containers.They only get chewier and better over the next couple days, if they last that long! These only need to be baked until they are browned and crunchy on the outside, as you want the inside to be nice and chewy! The nutritional numbers do NOT include the chocolate on top, as the amount you use will vary! This is just for the macaroon. Karlynn, these sound uber yummy! I’m eager to try the recipe, and perhaps add it as a new addition to my baked holiday treats. I’m curious, though – what chocolate type do YOU prefer for dipping the macaroons?